hey guys, i just joined this KAL! i'm finding it very helpful, so thank you for all the cool entries and tips. i'm going to be extending the stockinette section by an inch or two by the time i get there, as many of you have suggested. i'm using rowan cotton glace - seems to be working well so far. i'm making the smallest size (33.75 in). Welcome from another newbie! 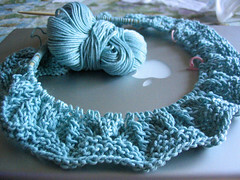 So new, in fact, that I haven't even cast on yet...I'm a bit afraid to, as I'm new to lace and after reading all these entries, this project seems a bit daunting. I'm not one for modifying patterns--I tend to stick with the pattern, mainly due to math anxiety. You've got a great start! The yarn looks great, and I love the color. hey katie, thank you. i'm having a little trouble with the lace myself. *lol* this is the second lace pattern i've ever worked on, the first being stephanie japel's orangina. i've already had to frog back a couple rows now and then. good luck to you if you decide to cast on! Rosann, your LBT looks great so far. That is a beautiful color, and I can't wait to see your finished product. I've never worked with that yarn before, so I will be checking in to see how you like it. You are not alone with the lace. I had to restart three times because I kept messing up. I would suggest using a lifeline. (You can find a free video tutorial at www.knittinghelp.com by clicking on "more..." from the drop down menu for "basic techniques".) I didn't use a lifeline, but it would have saved me many hours if I had. thank you, ocdeviant. your FO is lovely, btw! i love the crocheted edgings; i might try something similar because i don't really like the garter stitch. i finished 1 lace pattern repeat and found out the smallest size is ginormous on me (i really should have swatched...). so i'm going to frog the thing and cast on only 160 st instead of 200 and figure things out from there. boo. i like the cotton glace so far, though. Such a pretty color! Am looking forward to your finished LBT.